2016 was the first year that I took the Good Reads reading challenge. I’m suspicious of New Year resolutions. They tend to be overly optimistic and, thus, unrealistic. And unrealistic resolutions lead to disappointment and self-blame. At the same time, I’m a fan of goal-setting. So in early 2016 I thought, well, what if I take the challenge, but with a modest, easily-achievable goal? 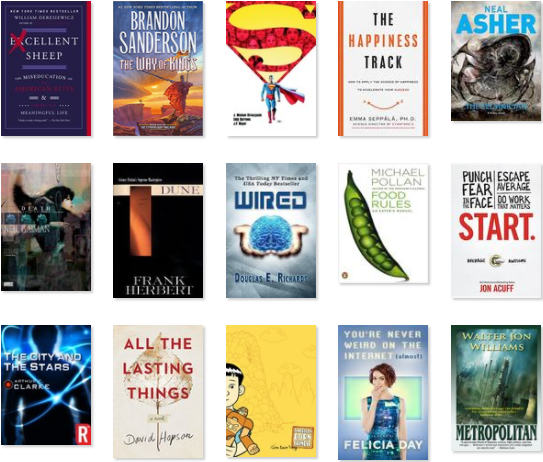 And so I signed up for the Good Reads challenge, with a goal of 25 books for the year. Turns out that was a very modest goal, indeed. Abandoning books without finishing them is another first. I’ve always been reluctant to do this – what if the book gets better later? how can I have an opinion about this book if I haven’t read all of it? am I a quitter? But life is too short to waste time on books that I am not learning anything from, or are not inspiring or giving me joy. All in all, it was a good year for my reading. I read some really fun fiction, such as Mr Mercedes, 14 and A Song of Ice and Fire (books 1 to 5) (still making my way through book #4, not bored yet!). I continued to make my way through the Banks’ Culture series, reading Use of Weapons, which did not disappoint. Surprising myself, I decided to re-read Dune, which surprised me for being as enjoyable as it felt 18 years ago (though less profound, perhaps). In the comic book category, Monstress Volume 1: Awakening was stellar. Stellar art. Stellar storytelling and worldbuilding. Stellar to read fiction with a three-dimensional female lead. I’m looking forward to the rest of the series. An honorable mention in comic books goes to Habibi, another story about a corageous woman. This book was a gift from a good friend, and in addition to a heart-breaking story and delicate line art, it helped me learn a little bit more about the Quran. For 2017, I am taking the challenge again. This year I’ll officially aim for 50 books (and secretly hope for more). I want to be more intentional about what books I choose to read. This means focusing my reading choices on topics of particular interest to me, and on books that come highly recommended by trusted sources.